Once your client account has been created, you can modify the information located in your profile. First Name = Your first name as you'd like to be known as in the CALS HelpDesk system. Initially this field contains your first name as it was either populated from ACS customer listing OR campus netid information. This is a required field. Last Name = Your last name as you'd like to be known as in the CALS HelpDesk system. Initially this field contains your last name as it was either populated from ACS customer listing OR campus netid information. This is a required field. 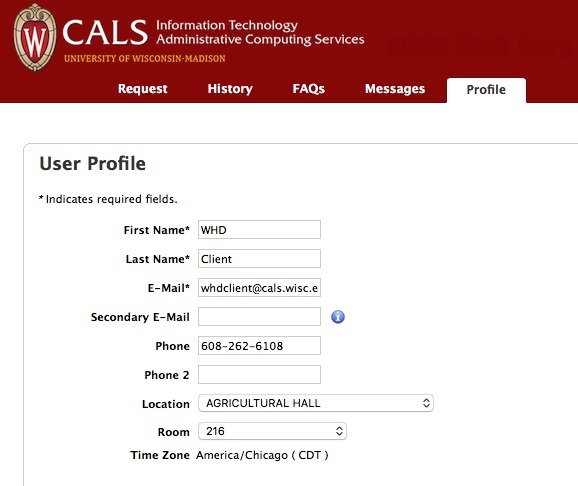 E-Mail = Your primary UW-Madison email address to be used with the CALS HelpDesk system. Initially this field contains your email as it was either populated from ACS customer listing OR campus netid information. This is a required field. Secondary E-Mail = This field is used for any other email addresses you'd like to be able to send "from:" when submitting/modifying tickets via email. NOTE: You can add multiple email addresses separated by "," in this field. Phone = The phone number that you'd like affiliated with your profile. This will be used by CALS HelpDesk technicians should they need to contact you via phone. Phone 2 = If there's an additional phone number that should be used for contact purposes, please enter it in this field. Location = Your UW-Madison Campus Building name. If your location does NOT appear in the list, please contact acs@cals.wisc.edu. Room = Your office room number. If your room does NOT appear in the list, please contact acs@cals.wisc.edu. Once you have finished modifying the information on the page, click on the Save button in the lower right-hand corner of the screen.